Those peppers are still coming on strong, even in this drought and heat. I am not a huge fan of home-canned salsa, but I do like to throw it in when making chili. These jars will come in handy this winter when it is subzero and snowing outside. I am wistful for freezing temperatures and possible snow days. Come on! School hasn’t even officially started yet (even though I am back at work). Reality check needed, please! Most importantly, I was able to use a whole cup of jalapenos for Pepper-palooza! 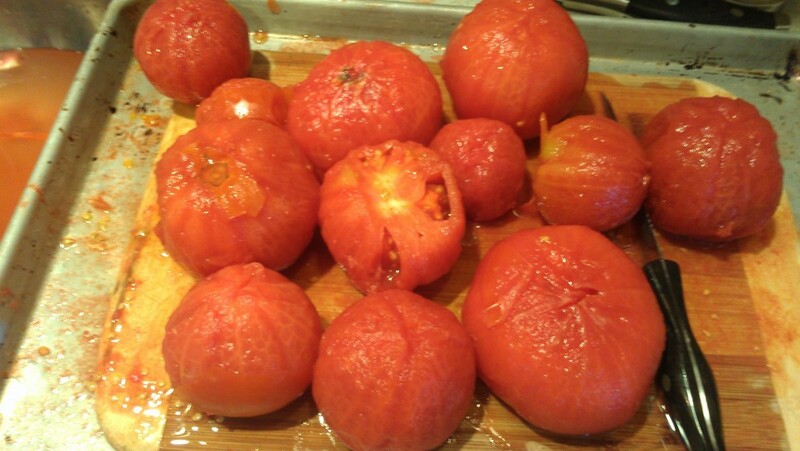 Dip tomatoes in boiling water for 30-60 seconds until skins loosen. Place in ice water bath and slip off skins. Place your cutting board on a rimmed baking sheet. This method will keep all the juices from running everywhere. In a 6 to 8 qt. saucepan, combine all ingredients. Bring to a boil, stirring often. Reduce heat and simmer 30 minutes, or to desired thickness. 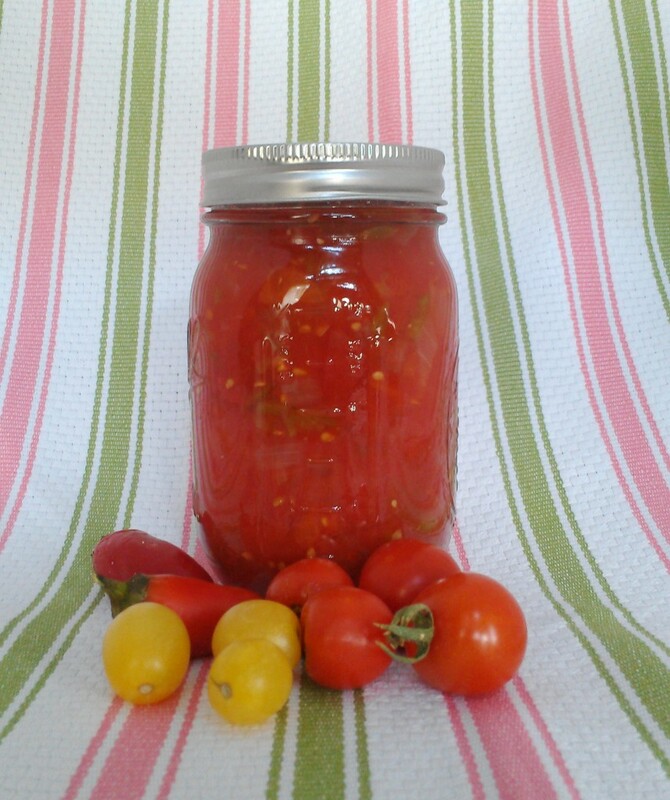 Immediately fill hot pint jars with salsa, leaving ½ inch headspace. Carefully run a nonmetallic utensil down inside of jars to remove trapped air bubbles. Wipe jar tops and threads clean. Place hot lids on jars and screw bands on firmly. Process in water bath for 15 minutes. Yield: 6 pints. We have cleaned out one of the closet shelves in a guest bedroom as an annex to our pantry for all our home-canned goods. The farmers market we visited was in Bentonville, Arkansas. We made a short trip eastward to see Crystal Bridges, an outstanding new art museum focusing on American art. More about that later, but if you are within driving distance of this art museum, you must go! Thanks, CCU. It is ready for winter soups, chilis, and stews. I’m not a fan of canned salsa either, but I do love the fresh stuff. Of course, I’ve never thought about keeping a few jars of canned on hand for those days when I want it as an ingredient. You always come up with the best ideas. Thanks, Christiane. I am hoping for another trip to a big FM where I can barter for some more seconds. Yes please. I’ll eat salsa any way I can get it! It is a cute town. We had never been there before. More to come on that visit later…. What a spicy salsa! This looks delicious and what a treat it will be in the fall/winter when you get to enjoy it! I actually may use some in a jalapeno popper filling this week. I had a half jar that I couldn’t process so it went in the fridge. I heard that the way to make peppers hot is to make ’em mad by not watering them. 🙂 Is it true? Do they get hotter in a drought? Your salsa is beautiful! Soon I’ll be canning with you, as every time I see you canning I want to join you! Please, do join me. I have never heard that about peppers. I am making some more hot sauce with these drought peppers but I won’t taste for a couple of more days. I know the jalapenos I picked and ate today were still pretty mild (for me). Yum! I have lots of tomatoes. Not from my garden. All my tomatoes died from something. I am so ready to make this. I have a few tortilla chips to go with it. I will cut back on the hot pepper. I cant hang like I used to. That salsa is really gorgeous and vibrant–I love that you left some of the seeds in to give it a nice kick. 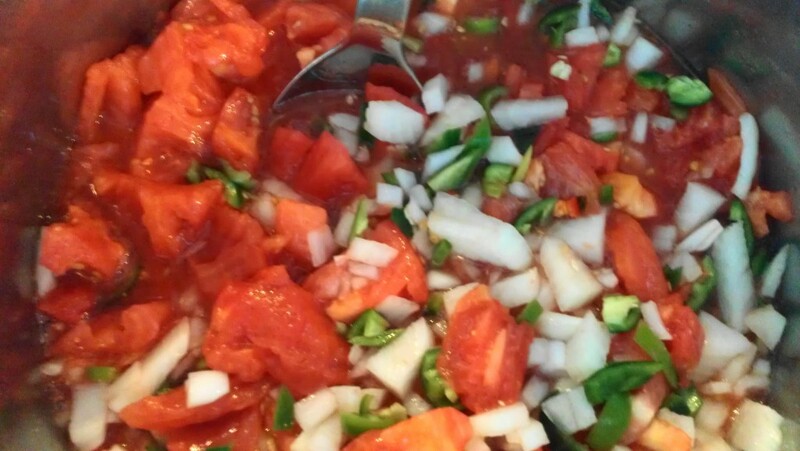 This salsa looks perfect especially over nacho chips or fried pita bread! I will take that as a complement! If I could grow a stinkin’ tomato I would can a surplus and maybe have some extra. A lovely salsa. I would love to use them to make a veggie pizza!